Your turtles would be perfectly happy in a midsize tank that provided dry space and wet space, plus a few nooks to hide in. But creating the ultimate turtle habitat can give you a zoo-worthy display that becomes a decorative element of your home. Consider the physical and health needs of your turtles, as well as appearance, when constructing your habitat masterpiece. Turtles grow at different rates. Before you invest in or build an expensive habitat, consider the full size your turtle or turtles will grow to. If you decide to go the custom route and have a habitat built in your home, consider the expense of disassembling and transporting it if you later move. Exceptionally large tanks require time and maintenance to keep clean and attractive. So factor this into your decision of where and how to establish your ultimate tank. Aquatic turtles need both wet and dry spaces, which gives you the opportunity to create visually dynamic layers in your tank. Consider stratified layers of substrate or sand, alternating different colors of rock, slate and stone for a dry side that slopes gradually into the water. Build in caves, glass marble bottoms, slate bridges and swim-throughs so your turtles have a variety of places to hide and play. You also can purchase commercial faux rock “decks” that attach to the side of the tank with suction cups to provide “floating” platforms where your turtles can sun themselves. Include aquarium plants or foliage to add color and to give your turtles cover. Always use non-toxic plastic plants. Be prepared for any live plants to eventually be seen as “snacks” by your turtles and to need regular replacement. 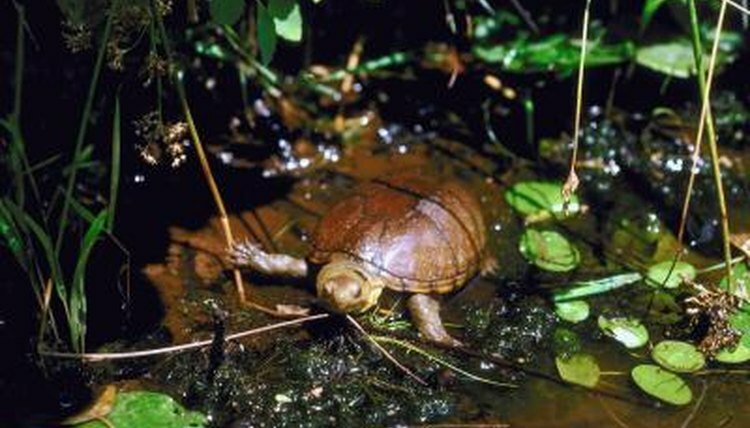 Box turtles, tortoises and other land turtles require only sand in their tank, supplemented by a shallow water bowl they can completely submerge themselves in. You can create a desert paradise for your turtles by using large pieces of gnarled driftwood as décor and making caves out of layers of multicolored sandstone or slate. Add a desert picture backdrop, available in most pet supply stores, to the back side of the tank. For an unusual and distinctive turtle habitat, consider giving your aquarium a custom frame made out of reclaimed barn wood or with a mosaic design. Whether you have land or aquatic turtles, all need to have light and temperature regulated per their breed’s requirements. On average, turtles require 12 hours of UV light per day and a tank temperature of 70-80 degrees. Tank maintenance, through use of a filter or a cleaning regimen, is also essential to ensuring your turtle’s health. In addition to keeping your turtles healthy, a clean tank with multiple visual elements is pleasing to the eye.